2013 is trying to work me over. Seriously, it has been five weeks of curve balls, surprises, schedule readjustments, pinch hitting and just taking care of what is important. But it has also given me the chance to prove, to myself and my family, that writing is important to me. I may have missed a day here or there, but I have really tried to spend at least 30 minutes a day with my writing. When I first started on this writing journey, it was just something to dabble in, a hobby even. I needed something that was mine and this was it. But then, writing became part of me. I was studying books on the craft, attended a few conferences, and felt the joy that writing was bringing to my life. But it wasn’t a commitment yet, which meant I would make people around me feel guilty if I didn’t get a chance to write, and my complaining would take place while watching reruns. Yup, I’m a jerk. Writing was something that I wanted to do, but not enough to make the sacrifices to do it. And I’d always argue that I didn’t have time. Sometimes I’m a slow learner, but I realized no one ever has the time. Seriously, think about your day. What will you make sure happens no matter what? (Diet Coke run) It is something that has moved up the prioritization list high enough that it WILL happen. It sounds like too simple of a solution, but it really is the key. If writing as a hobby is working for you, give it as much time as a hobby. If it is something you would like to have a more prominent spot in your life, prove it. 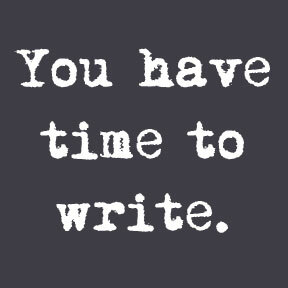 Show your writing that it is important to you. Show your family that writing is important to you. Prove it when you have just a few minutes by writing, revising, editing, querying, whatever. And when life throws you a series of weeks like 2013 has for me, you will still be able to write. How do you prioritize your writing? What have you given up in the sake of writing? I have trouble giving up sleep, but that's what I've been doing lately. Was up at 4:30 AM this morning. I can't do that too many days per week, but since I'm up feeding my newborn, it makes sense to just stay up and get that couple of hours in before my four-year-old wakes up and the day starts. I gave up working full time. I'm down to teaching 25 hours a week. I know I'm very fortunate to be able to do that; but – like you said – if you are serious enough about it you find a way. When I was working full-time I often gave up sleep. I'd only get 4-5 hours a night most times. For most people, if you unplug your TV you'll be amazed at how much extra time you have every day.